William Noel Hodgson never planned to be a soldier: he wanted to write. The Great War made his name as a poet but it also claimed his life. Before Action traces his path through the pre-war world and explores his reactions on the outbreak of war. His story is personal but it evokes the experience of a generation. It was death on the Somme that made Noel Hodgson one of the most loved of the soldier poets. In the final years of the war and through the 1920s and ‘30s his work was widely quoted and reprinted, broadcast, and even set to music. Today, he is remembered not only for his poetry but for his part in the opening day of the Somme offensive on 1 July 1916, the most deadly day in British military history. His battalion, the 9th Devons, lost well over half of the men who went over the top that morning and every officer but one, dead, wounded or missing, mostly in the first half-hour. 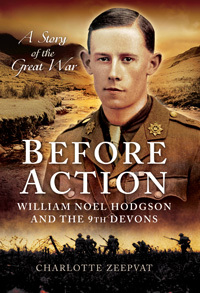 Before Action draws on Hodgson’s own writing and on the unpublished letters and diaries, photographs and drawings of his fellow officers to tell his story and, in doing so, to recreate the experiences of a 1914 volunteer battalion. Through their eyes we see everything from the lighter moments of being a soldier to battle at its most harrowing: at Loos, where Hodgson won the Military Cross, and on the Somme. The book offers an important new explanation of what happened to the 9th Devons that fateful morning and its wider themes of family and friendship, war, grief and remembrance, are universal.